Imam Qari Qasim | Personal website of Imam Qari Muhammad Qasim. There was a time when having unpleasant mouth odour during fasting was considered a source of pride and a humbling experience. The one fasting knew that his foul smelling breath was more pleasing to his Lord than the best smelling perfume of this world. The times have changed. Now people consider missing their fast in order not to offend their clients or colleagues with their mouth smells. In the fallowing clip Mufti Akmal explain the permissibility of using toothpaste during fasting. His points are that toothpaste or mouth wash can be used during fasting for people who have to deal with public. While using toothpaste, one must ensure that toothpaste residue do not go down this throat and that one must feel that he/she is doing an undesirable act. Such permission is not a blanket permissibility for everyone to start using toothpastes or mouthwash during the fasting period. May Allah make it easier for us. Aameen. If a person has so many affiliations how can that person truly worship one God and practice the teachings of his Prophet and Quran. Surely our understanding of Islam will be influenced by our other affiliations. Our worship of Allah will be influenced by our associations and connections. It is extremely difficult for a person to put aside his own inner self and truly submit to the teachings and commandments of Allah almighty. I am deeply troubled with the recent incident with Shaykh Hamza Yusuf. What he has said during RIS 2017 interview with Mehdi Hasan is for him to clarify and ultimately to be answerable to Allah. But what has troubled me is that how Muslims have started using this incident to disrespect and to go as far as to ridicule a Muslim scholar. It seemed as if the some Muslims were over joyous just to know that he had made these remarks and it became uncontrollable for these Muslims to start spreading and disseminating his comments online. It was a one time opportunity for these Muslims to show their frustration and their dislike of this highly esteemed scholar. How could these Muslims let go of this opportunity not to show their inner jealousy for Shaykh Hamza Yusuf. All of his years' of learning and service to Islam and to the Muslim community was left aside due to the political, national or race affiliations of those people who were throwing insult at Shaykh Hamza Yusuf. One of the methods used to ridicule Shaykh Hamza Yusuf is to give him the title of Sufi. In their articles and social media posts Shaykh Hamza Yusuf is increasingly being referred to as 'Sufi Hamza Yusuf'. Due to their religious and sect affiliations they regard 'Sufi' and what this word stands for in a lower state. By replacing 'Shaykh' with 'Sufi', this is their way of showing their disgust towards Sheikh Hamza Yusuf. It is also a sad state of affairs that a word that had such hight prestige and status in the past is disregarded in the current times. Part of the blame goes to the people who claim to be sufi and yet do not practice authentic sufism. This has given a bad reputation to sufism and ammunition to the opponents of sufism. Therefore, by calling Hamza Yusuf a sufi, he is being associated with a malpractice in Islam with a hope to taint his reputation of being the most respected scholar in the Western land. But we should deduct positivity out of every negativity and hope that the new title is a compliment to Shaykh Hamza Yusuf's list of achievements. After years of learning and hard work he has finally moved towards a higher station of wilayat. Everybody is becoming a Shaykh nowdays and less and less people are becoming Sufi as it takes less effort to learn knowledge and takes greater efforts to apply that knowledge to our nafs. That is, his discourse goes beyond the limit of their comprehension and so they consider what he says a transgression or a blasphemy." So congratulations to Shaykh Hamza Yusuf on becoming a Sufi and we pray to Allah Almighty that he enables the rest of us to also follow in the footsteps of Sheikh Hamza Yusuf in learning and disseminating knowledge to others. I have never had a personal sitting with Sidi Hamza Yusuf, therefore I do not know his personal views about what he said in his interview. This article is not in defence of Shaykh Hamza yusuf but in defence of respecting our elders and respected scholars. This post was written with no particular person in mind therefore if you find it offensive please do not think it was aimed at you. 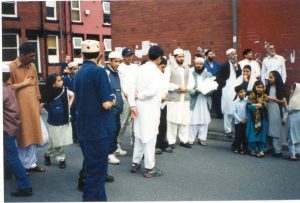 29th August 2003 (1st Rajab) was a unique memorable day in the lives of the Muslim community of Leeds. This was due to the opening of a new magnificent mosque in the heart of Leeds city, in Leeds 6, called Makkah Masjid. Makkah Masjid had been under construction for the last 3 years and it was finally completed last August with the total cost of &pound;1.8 million. 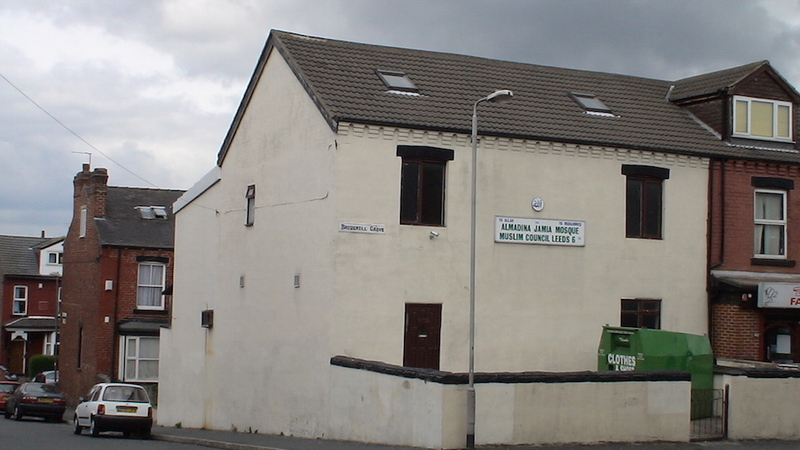 Previously, al-Madina Masjid had been fulfilling the needs of the Leeds 6 Muslim community. Al-Madina Masjid was founded in the early 1970s by purchasing 2 small houses and converting them into a mosque. 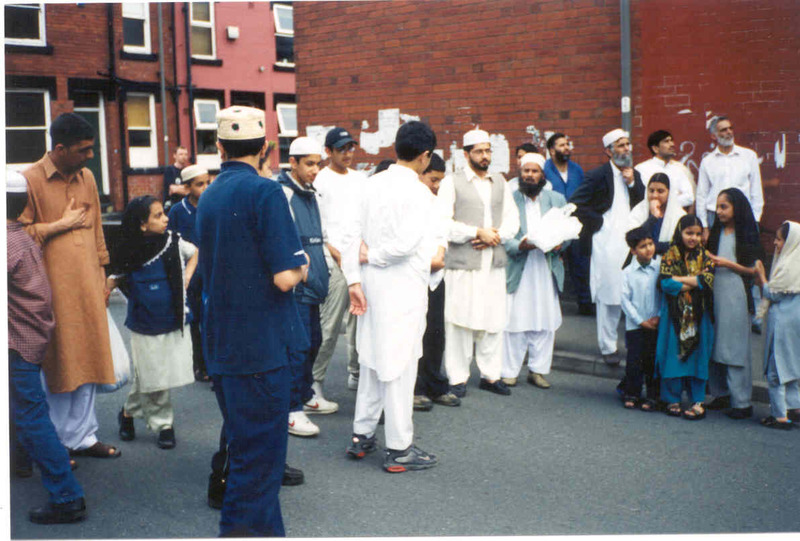 However, as the Muslim community increased around Leeds 6, one house was incapable of accommodating all the attendees of large gatherings such as Friday or Eid prayers. Therefore, expansion of the al-Madina Masjid was deemed necessary. In 1989, some renovation and extension work was carried out at the cost of &pound;60,000. 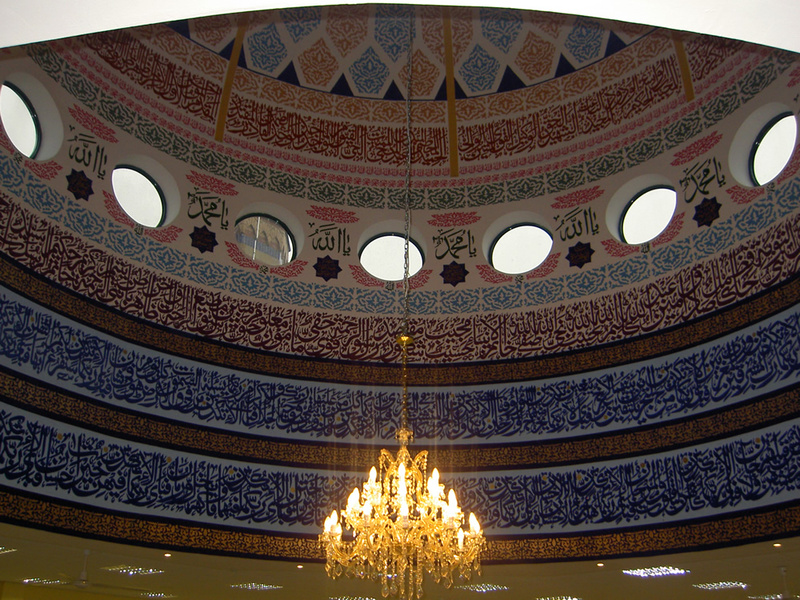 After the extension, the al-Madina Masjid was able to accommodate 700 attendees. As time went by, Muslim population continued to increase in Leeds. In mid 1990s, al-Madina Masjid again started facing problems in accommodating all the attendees of large events. For instance, for important Friday prayers, such as the Friday prayers in Ramadan, every part of the al-Madina Masjid would become full and people had to find place wherever they could to offer their prayers. Some people even had to pray in the kitchen, corridors or on the landing. Similarly, jamat for Eid prayer was said 2 times in order to allow all the Muslims of Leeds 6 and surrounding areas of Leeds 3 &amp; 4 to perform their Eid prayer without any trouble. However, even with 2 jamaat, the mosque would become full and people would still face trouble to find a suitable place to pray. The problem of limited space became so intense that people stopped coming to the al-Madina Masjid and had to travel to other areas to attend the Friday or Eid prayers. 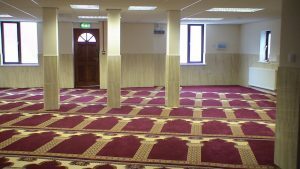 Leeds Muslim Council (the management committee of al-Madina Masjid) finally decided that increasing the size of the mosque was the need of the hour. However, like last time, this time al-Madina Masjid could not be extended as there was no next-door house which could be included into the existing mosque. It was also felt that a mere extension of the mosque would not be suitable for future needs. As the Muslim population would grow in Leeds 6, the mosque would again become small in size. 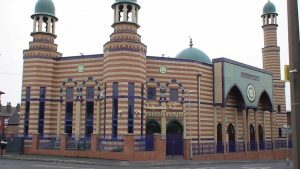 What was needed was a purpose-built mosque that would be suitable to cater for all the possible future needs of the Muslims in Leeds. 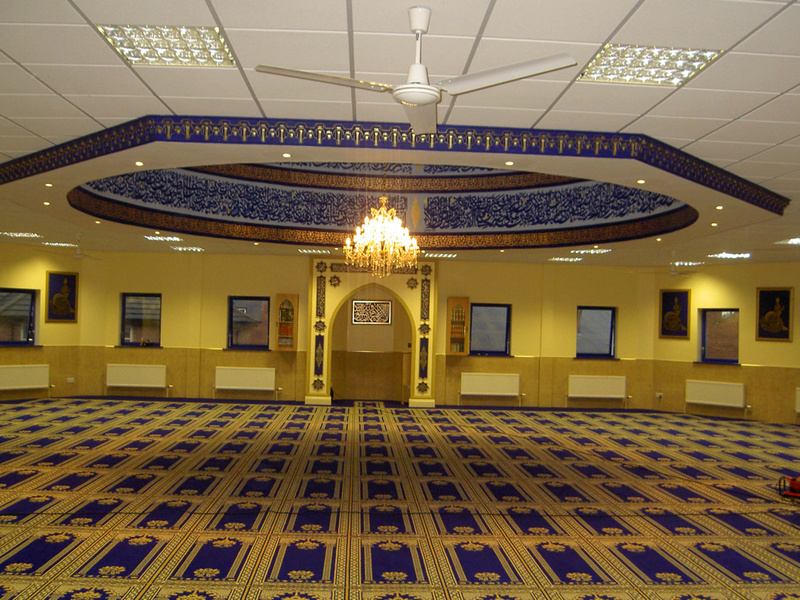 To build a purpose-built mosque, a suitable location and land was needed. As Leeds 6 area is near the 2 universities, all the suitable lands had already been acquired by big businesses or were far away from the Muslim community&rsquo;s residential area. There was only one property on sale which was thought to be suitable for the construction of a Muslim worship-place. It was a run-down church which had been abandoned for many years. As a matter of fact, it was a unique church which had been constructed with wooden structure and was a registered listed&nbsp;building. 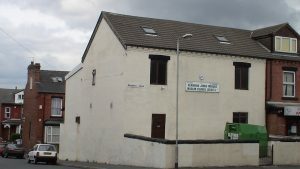 The plan was to buy the dilapadated christadelphian church, demolish it and construct a purpose-built mosque on the site. When this plan was presented to the Leeds City Council, they opposed the plan on the basis that the church could not be demolished as it was a listed building. A long and hard battle (with the help of local MPs and councillors) had to be fought with the local city council to convince them that the existing building (the church) was a place of worship, and the new building (the new mosque) would also be a place of worship. A survey of the local residents was also conducted to take their point of view on replacing the run-down church with the new mosque. Muslims and non-Muslims said alike that they were most happy to replace a ruined building which portrayed a negative image of the area with a uniquely constructed building which would add a fresh view to the area. The new purpose-built mosque, called Makkah Masjid, was given a go-ahead in the year 2000, with the estimated total cost of &pound;1.5 million and a time span of 3 years. As imagined, raising &pound;1.5 million from the local Muslim community was conceived to be the most difficult and hardest part of constructing a new mosque, but with the grace of Allah (SWT) nothing is impossible or unachievable. As a matter of fact, when the plan of the Makkah Masjid was presented to the local MPs, and when they saw that the amount &pound;1.5 million was needed to build the mosque, the only thing they said was: &ldquo;this is impossible&rdquo;. But the Muslims of Leeds 6 and surrounding areas of Leeds 3 &amp; 4 put their faith in Allah (SWT) and believed that they were building the house of Allah, and trusted in Him to guide them through difficult and hard times. A great deal of strategy and planning was formulated by the Leeds Muslim Council before embarking on this laborious and demanding task. Before starting the work at the new mosque, priority was given to collect funds as the management committee did not want to stop the work on the new mosque by running short of funds. 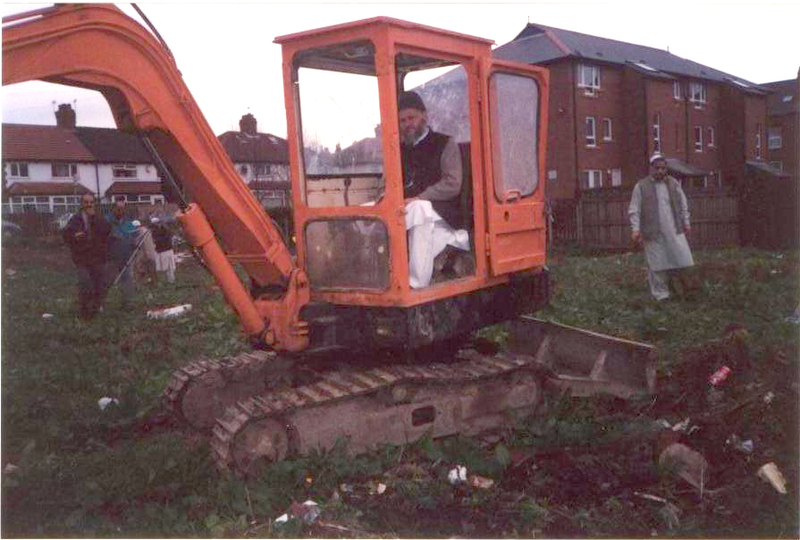 Only when enough fund had been collected, the work on the new mosque commenced. As mentioned above, the construction of the Makkah Masjid was estimated to cost &pound;1.5 million which is a vast amount of money to be collected by one community. 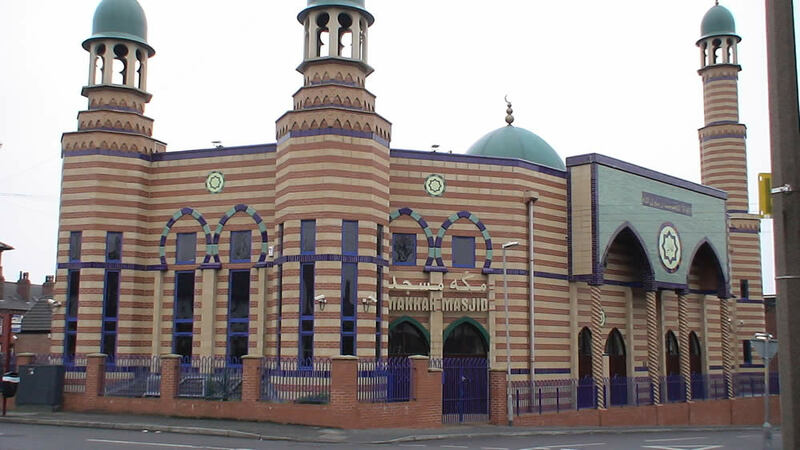 The Muslim community of Leeds 6 and surrounding areas does not comprise of big businesses or entrepreneurs, but of standard jobs such as taxis or take-aways. But when it came to contributing for the new mosque, the Leeds Muslim community opened up their hearts and contributed generously for this great cause. The Muslim community realised that the new mosque was an important factor in their lives and a mark of Muslim identity in general, and they did not fall short in making their donations according to their best capacities. Some creative strategies were devised by the people to raise the level of funds. For instance, one person who used to work at a taxi stand, started collecting &pound;1 each week from other taxi drivers and gave this money to the new mosque funds. Following this good example, other people from other taxi stands also started contributing in a similar way. Similarly, one barber shop started giving &pound;10 each week to the new mosque fund. Following this step, other barber shops also started giving &pound;10 weekly to the new mosque. It is often said that good behaviour in people leads to good behaviour in society, and construction of the new mosque is a good example where people contributed open heartedly by observing good actions of others. Collection of such vast amount of funds was made possible by constantly encouraging the Muslims to contribute to the mosque fund. The members of the mosque committee set-up a good example by donating from &pound;10,000 to &pound;30,000 each. This good example inspired other members of the community and almost each household in the community donated at least &pound;3,000. The whole process of building Makkah Masjid, including planning, raising funds and the construction work, took only 4 years. The construction of Makkah Masjid in such a short time was only made possible by the hard work of Leeds Muslim Council who were committed to put sleepless nights and long hours into this project and to see it to a successful completion. Leeds Muslim Council kept extremely good and close liaison with the Muslim community, created successful relationships with the local government, entrusted the jobs and duties to the most suitable persons and financially kept within their limits. 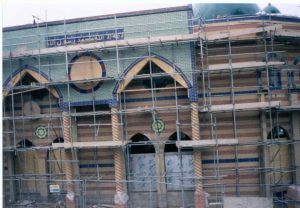 With the grace of Allah (SWT), blessing of the Prophet (peace and blessings of Allah be upon him), generous contributions of the local Muslim community and the unwavering commitment of the Leeds Muslim Council, Makkah Masjid was finally opened on 29th August 2003 (1st Rajab 1424). The opening of the Makkah Masjid coincided with the month of Rajab in which the ummah of the Prophet (PBUH) was given the gift of 5 daily prayers. Makkah Masjid is another gift of Allah (SWT) given to the Leeds 6 and surrounding areas of Leeds 3 and 4 Muslim community to establish the 5 daily prayers. Makkah Masjid has 3 floors and can accommodate over 2700 people, which is more than enough for the coming generations. There are 2 main halls for men to use and there is another main hall for ladies. 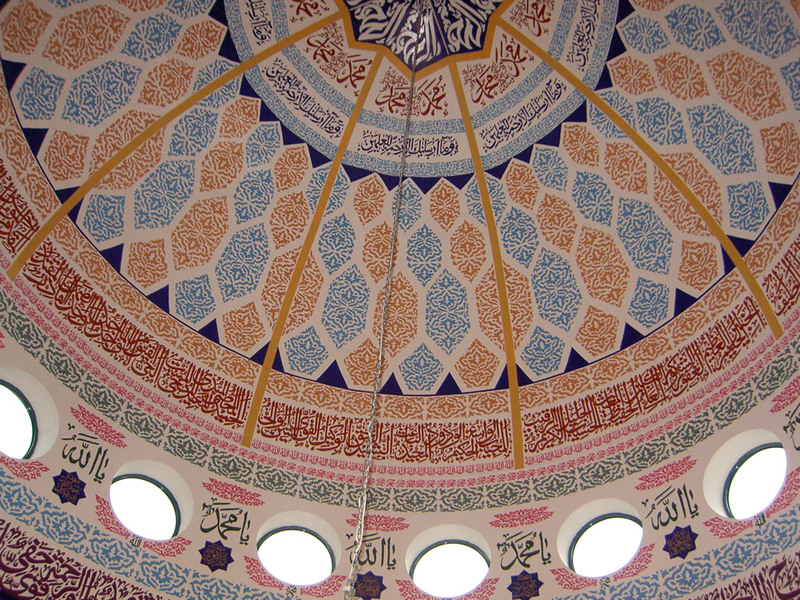 The mosque has 3 minarets and one dome. 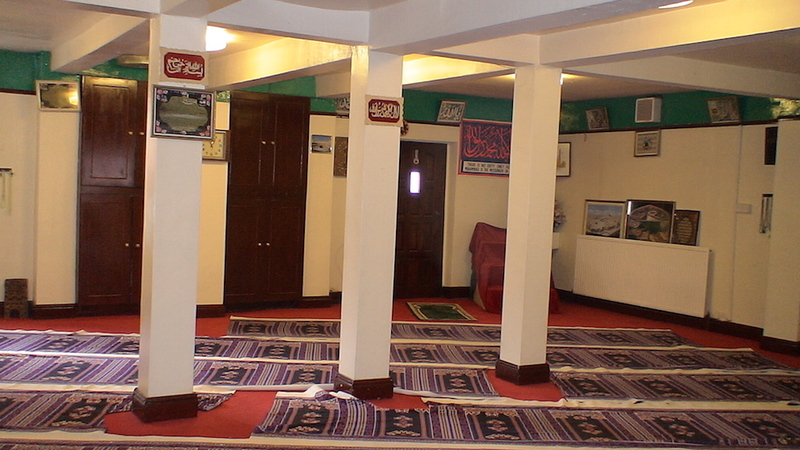 The mosque also includes rooms for computers and a library. The worshippers who attend the mosques are the actual beauty and charm of the mosques. However, while constructing the Makkah Masjid, the outward beauty and attractiveness of the mosque was also taken into consideration. Therefore, the outside walls are beautifully crafted by using a combination of blue, green and cream coloured tiles. The old mosque, al-Madina Masjid is also open for prayers and will remain running in future since mosques cannot be closed down. In conclusion, construction of Makkah Masjid was a huge project not undertaken by the local Muslim community previously. However, the Muslims knew that the new mosque was extremely important for them and then they stood united and committed and donated generously. Leeds Muslim Council, the management committee of al-Madina Masjid and Makkah Masjid, created a strong relationship with the local Muslims and the local government and spent a lot of their precious time and energy to ensure Makkah Masjid was completed successfully. Professor Hafiz Fateh Muhammad Sahib is one the few Ulama belonging to Ahle Sunnah school of thought in UK who have equal command of religious as well as contemporary knowledge. He has been serving as head teacher and Khateeb at Al-Madina Jamia mosque functioning under the auspices of Leeds Muslim Council. Professor Hafiz Fateh Muhammad was born to a landlord family of Chaudary Roshin Deen in Jammu city of Indian Occupied Kashmir in 1942. He started his education by memorising the Holy Quran by heart. The first ever teacher of Professor Sahib was his brother in law, Hafiz Umar Deen who was a resident of Bern village of Occupied Kashmir. He migrated to Sialkot via Phukhliaan, Gondal after establishment of Pakistan in 1947. After suspension of his Quranic education for some one and a half year, he completed it form Hafiz Umar Deen in Sialkot. He started contemporary modern education after that and continued his religious education simultaneously. He got the Quranic education including the art of Qir’at and Tajweed from the teacher of the teachers, Qari Abdul Rahman, Shaikhul Qurra, Qari Abdul Aziz Chishti and his cousin, Zeenatul Qurra, Qari Muhammad Hussain. He passed all the examinations right from primary to M.A with distinction and won scholarships. He got eighth position in the University of the Punjab in B.A. He did his M.A in English in 1965, M.A Islamic Studies in 1967 and M.A. Arabic in 1968 from the same university. After doing his M.A English, he joined education department in 1965. He was appointed as English Lecturer in Jinnah Islamia College Sialkot. He was transferred to Government College Shakar Garh in 1969 wherefrom he came to M.A.O. College Lahore in 1972. He taught English there for six months. When late Zulifqar Ali Bhutto nationalised the educational institutions he returned to Jinnah Islamia College Sialkot and remained the head of the English Department there for a long period. When International Islamic University was established in Islamabad in 1981, he joined it and remained the head of the English Department for two years. He came to England in 1984 for higher education and did his Masters in English Language Teaching and Linguistics from the University of York. Then he stared work for his doctorate, however, he has to discontinue his education due to ill health. He returned to Islamabad two year’s later and resumed his responsibilities at the International Islamic University. 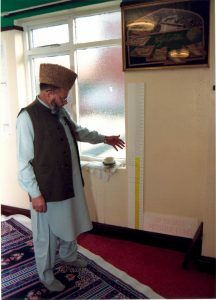 He came to Britain permanently in 1988 and joined the Al-Madina mosque of Leeds Muslims Council. He had also remained attached with the same mosque when he had come to England for higher education. Professor Sahib told that he also visited Occupied Kashmir in 1982. His father got a grand mosque constructed from his own pocket and at his own land at Subhaash Nager of Jammu city. During this tour, Professor Sahib also went to Srinager and was greatly impressed by the love of Kashmir people especially the school children for Pakistan and Islam. Professor Sahib also visited New York at the invitation of his pupil, Muhammad Ahmed in 1983. He recited the Holy Quran at a mosque of Jersey City during the Taraweeh prayers in Ramadhan as well as delivered Juma sermons. He said that after witnessing the love and sincerity of the newly converted black Muslims there, he was fully convinced that Islam is not only the religion of the East but it was also the religion of the West. He said that the prophecy of the Holy Quran about sending his Holy Prophet to teach humanity the true religion is about to be materialised. This prophecy has been made at three different places in the Holy Quran with slight change of words. Professor Sahib said that he was doing his PhD from the Leeds University on the exegesis of the Holy Quran, particularly the Coherence of the Holy Quran. At the same time, he continues to render services as Imam, Khateeb and teacher at the mosque. Both his sons are also Hafiz and Imams. Professor Hafiz Fateh Muhammad said during the course of the conversation that he was always attached with the saintly people. He had special spiritual relation with Hazrat Allama Peer Muhammad Husain of Sialkot and after his death with his son, Hazrat Peer Bashir Ahmed. He also delivered Juma sermons at Kashmiriaan Mosque at Rangpura, Sialkot, after peer Sahib’s death probably in 1964. This service continued for some twenty year till 1984. He has also been linked with Syed Muhammad Ashraf Alias Kashfi Shah Nizami who is the father of prominent lawyer and former law minister, S.M. Zafar and Doctor S.M. Iqbal. He was the spiritual successor and Khalifa of Shamsul Ulama Shaikhul Mashaikh, Hazrat Khawaja Hassan Nizami Dehlvi in Pakistan. Professor Sahib also got the honour of leading his funeral prayers at Chak Qaziaan near Shaker Garh. However Professor Sahib swore the oath of allegiance to Zial-ul-Ummat Peer Muhammad Karam Shah Al- Azhari. 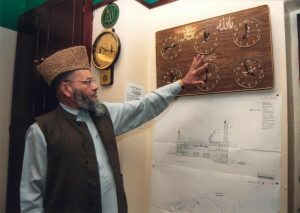 Talking about religious services and activities after coming over to England, Professor Hafiz Fateh Muhammad said that when he came to England in 1984, the number of people who came to say the Juma prayers at the mosque was very low. However, he thanks God that now some eight hundred people offer Juma Prayers. Nearly two hundred children are getting religious education here. Interested children are memorising the Holy Quran by heart as well. Some children have already memoried the Holy Quran by heart and are now getting education in universities. When asked whether lack of command of English language on the part of Ulama can be held responsible for the estrangement of the youth from religious, Professor Fateh Muhammad Sahib said that it is correct. If we do not give education to the new generation in English, they would not become fully conversant with the religion. Even under ordinary circumstances, when people migrate to another place, their children do suffer due to the language problem. The regrettable thing is that like in Pakistan, parents in England do not take interest in the education of their children. On their part, the children do not take interest either. He said that he delivers a lecture daily on Quranic teachings and explains it both in Urdu as well as in English. It is important for us to give religious education in English in order to make the new generation understand religion of Islam fully well. Talking about the future of the new Muslim generation in Britain, Professor Fateh Muhammad said that despite their ignorance of English, Ulama have been making efforts to attract the new generation to Islam. God willing, the future of the Muslim youth is very bright in this country. The new generation is becoming more and more inclined to Islam and if we compare the situation with that of Pakistan, more Namazis are found in British mosques than those in Pakistan. Our mosque is jam-packed during Friday prayer. However, hard work and affection is the basic condition to keep the love of religion kindling in the hearts of the new generation. Referring to his services in the field of writing and compilation, Professor Fateh Muhammad said that he could not do any considerable work in this field so far. He said that when he was working for Doctorate, four or five of his articles were published in international journals. Hazrat Peer Muhammad Karam Shah had desired that the exegesis of the Holy Quran, Jamalul Quran, authored by him should be translated into English. God willing, it would soon be published. 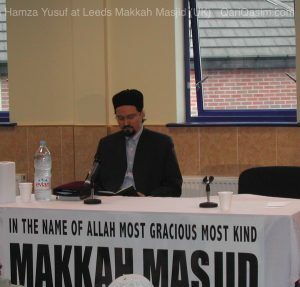 Professor Hafiz Fateh Muhammad said that the Leeds Muslim Council does not only run the affaires of the mosque but also actively participate in other issues and affairs of the Muslim community. He said the Council did an excellent work against the blasphemous and cursed writer, Rushdi. We also collected funds for the Muslim community of Bosnia as well as the suffering people of Afghanistan. We also collect funds for the oppressed people of Kashmir and send it through the Muslim Hands working under the patronage of Sahibzada Syed Lakht-e- Hasnain Shah or through the All Jammu and Kashmir Sunni Hurriyat Council, Britain or nay other Muslim organisation. We also collected two thousands pounds for the self-reliance fund raised by former Prime Minister, Muhammad Nawaz Sharif. Besides we have been asking the people to contribute for the fund and remit their money to Pakistan through banking channels instead of Hundi. Professor Sahib said that presently, Doctor Haji Muhammad Jamil Malik is General Secretary of the Leeds Muslim Council, who is PhD in Economics. He has his own firm of Accountancy. He is imbued with the spirit of Islam and urge to serve the cause of the Muslim Ummah. He is assisted by Joint Secretary, Chaudhary Haji Muhammad Munir who has been associated with the council from the very beginning. He had also been Chairman of the council. He is very sincere, humane and gentle person, Chaudhary Haji Qurban Hussain, is the Chairman and chaudhary Haji Fazal Rahman in the treasure of the council. All the colleagues are imbued with the spirit of serving Islam and are actively participating in collecting funds and donations for the mosque. 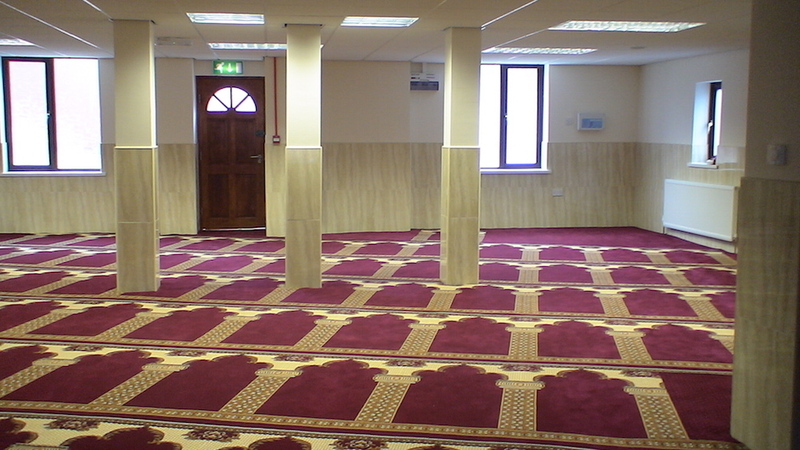 People from Leeds, 3,4 and 6 and adjoined areas come to our mosque to offer Friday prayers. Sixty to seventy people offer daily prayers. It is reflective of the attachment of the people to Islam and the same love and attachment is required construction of bigger, expansive and grand new mosque. Professor Sahib said that a new expansive and grand mosque is under construction under the auspices of Lees Muslim Council near the Madina mosque. This new mosque would be called Makkah Mosque, and an amount of a half million pounds has so far been spent on its construction. Whereas the total cost is estimated the 1.5 million pounds. Basic infrastructure has been built. It is expected that the mosque would be completed within next two years. The present Al- Madina mosque would continue to function at its present site Madina mosque would continue to function at its preset site even after the completion of the Makkah mosque, which will accommodate about 2500 people in its three floors. To a question, Professor Sahib said that Islam spread in the Indo-Pak Sub-Continent due to the efforts of Sufis. Similarly efforts are underway in this country to attract the non-Muslims to Islam. Different Mashaikh pay visits to this country every now and then. 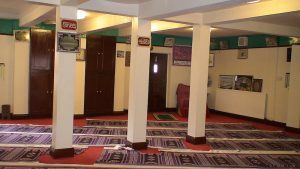 Some of them have established centres here in which Zikr gatherings are held and work for the promotion of Islam is carried out. Some forty men and women have embraced Islam since his coming over to this country. For students of Leeds University embraced Islam last year. They are leaving for Morocco to learn Arabic. All this is due to the efforts of Sufis and religious scholars. Thanks to Allah Almighty a prominent orientalist of Leeds University also embraced Islam recently. Referring to the occurrence of unwantedd incidents in some mosques, Professor Sahib said that the main reason is politics. Since are community cannot take part in the local politics, most of the politics centre round Pakistan and Kashmir. If a person gets a post in the mosque committee, it satisfies his egotism. There are other factors as well. The effects of the days of ignorance and lack of love for religion are also visible. Then we have prejudices on the basis of family background. Added together, all these factors make the situation complex. Talking about unity and harmony among Ulama belonging to Ahle Sunnah school of thought, Professor Fateh Muhammad Sahib said that all the Ulama are working actively in their respective areas. However, a wrong impression is being conveyed to the people due to their disunity. That is why we are making efforts to unite the Ulama because better results can be achieved through coordinated and united efforts. It would be possible only when we rise above ourselves and work together for the cause of Islam and show tolerance towards others. Professor Sahib said that he has two sons, Hafiz Qari Muhammad Asim and Hafiz Qari Muhammad Qasim. Qari Muhammad Asim has done his L.L.B from the Leeds University and is getting training to become a solicitor. He also renders the service as Khateeb at Al-Madina mosque during the absence of his father. He also Leeds Taraveeh prayers during Ramadhan. He is an eloquent speaker. Hafiz Qari Muhammad Qasim is conducting a computer course at Bradford University. 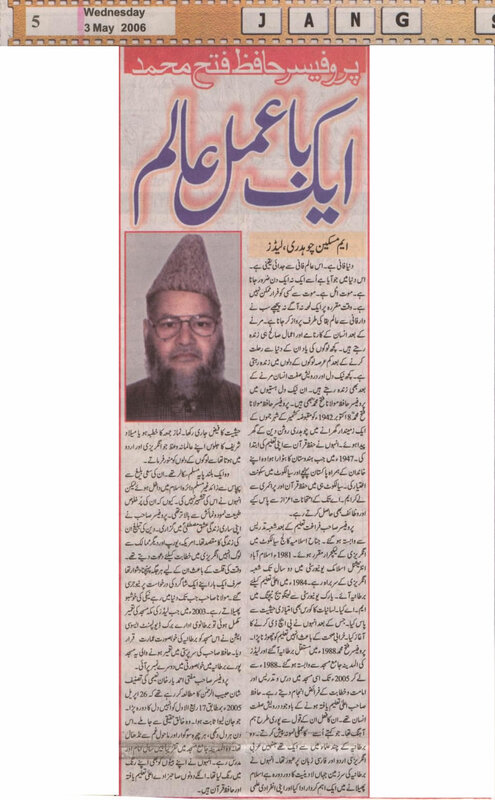 The following article was written by Choudhary Maskeen sahib of Leeds 12 and it appeared in Daily Jang on 3rd May 2006. Shaykh Professor Hafiz Fateh Muhammad Sahib, affectionately called Hafiz Sahib by all those who knew him, (May Allah have mercy on his soul) was the great Imam of Madina Masjid from 1984 – 2005 and of Makkah Masjid from 2003 to 2005. He passed away suddenly on the evening of 25 April 2005 (17th Rabi ul-Awwal 1426) whilst reading a biography of the Prophet (peace and blessings of Allah be upon him). His sudden departure from this world was a tragic loss to the Muslim community of Leeds which he had ardently and diligently served for over 20 years of his life. All those who had the honour to meet him will testify that Hafiz Sahib radiated love for the Holy Quran and our beloved Prophet (peace and blessings of Allah be upon him). He dedicated his life to gaining knowledge of Islam, living in accordance with its principles and encouraging others to do the same. Hafiz Sahib was one of very few distinguished Ulemas who excelled in both worldly and religious knowledge and understanding. He first came to England from his native Pakistan in 1984 to undertake a Masters degree in English Language Teaching and Linguistics. He had previously held the esteemed post of head of the English Department at the International Islamic University at Islamabad. He returned to Pakistan for a short while, before permanently settling in England in 1988 and taking up the post of Imam and Khateeb of Madina Masjid and spiritual guide for the community he served. Hafiz Sahib was not only a religious instructor but had also been a professor at one of the most prestigious Universities in the Muslim world. He was therefore passionate about ensuring that religion was accessible to second generation Muslims in the UK. He reminded Muslims that they had not come to the UK as Pakistanis, Indians etc, but as Muslims. He advised Muslims to leave aside cultural issues and concentrate singularly on the cause of living Islam as it was given to them by the Prophet of Islam (peace and blessings of Allah be upon him). Hafiz Sahib was always mindful of the numerous examples in the life of the Prophet (peace and blessings of Allah be upon him) of living peacefully alongside those of other faiths, whilst not loosing one's own faith and identity, and he strived to follow these examples. He emphasised that Muslims should earn their place in society and win the hearts and minds of the host community by showing that the values taught by Islam are the same values that all human beings hold dear. For this reason, a long before there was any wide-spread recognition of the fact that there was a danger of youngsters losing touch with their religious identities as a result of the fact that most religious sermons were being held in Urdu, Hafiz Sahib was preaching in both English and Urdu. He attached great importance to ensuring that youngsters had access to Islamic knowledge in their first language, English. Thus his professionalism enabled him to pursue and resolve intricate issues and challenges faced by the second generation with clarity and conviction, always preferring debate and discussion whilst observing the Islamic etiquette rather than just demanding that youngsters did as told. 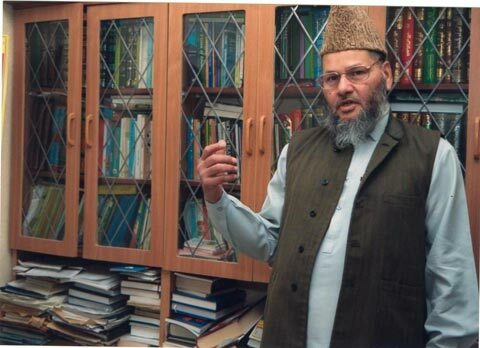 Another issue close to Hafiz Sahib's heart was ensuring good relationships between people of different faiths. To this end, he was an active participant in the Leeds multi-faith forums, which saw him recite the Quran at inter-faith events and welcome those of other faiths into the Masjid. Hafiz Sahib led a simple life which revolved around his role as Imam. His first love was the recitation of the Quran, which he did alongside whatever other task he was doing. Those who had the honour of hearing him recite the Quran know that his pronunciation was impeccable and his voice was melodious and full of emotion. The hearts of his listeners could not help but be moved, and through him his audience felt closer to Allah. Hafiz Sahib was also passionate about ensuring that Muslims did not blindly follow what they were told, but had a real understanding of the principles of Islam. His aim was to fill the hearts of the Muslims in his community with a love for the Quran as immense as his own, and instill in them a desire to understand the Quran as he did. 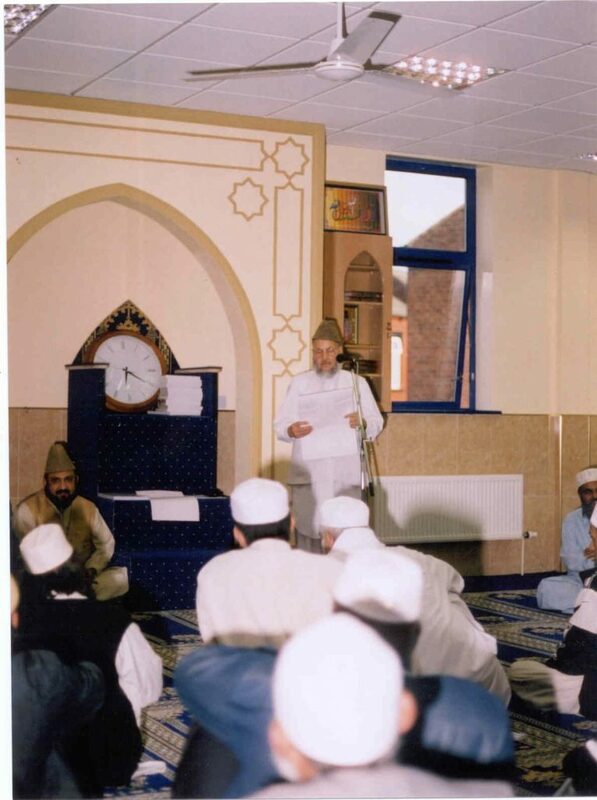 Over the last 10 years of his life, Hafiz Sahib held daily study circles after prayers. During these study circles, he provided detailed analysis and commentary on almost half of the Holy Quran in a combination of both English and Urdu. His daily classes were attended by both old and young. Hafiz Sahib's distinguishing trait was his unpretentious appearance and remarkable simplicity. Despite being well-versed in religious and worldly matters, he never promoted himself or tried to seek fame. Instead, he followed the way of his predecessors who worked behind the scenes, displaying profound insight and solicitude for the Ummah andshowing exceptional acumen for resolving the challenges presented by modernity. Despite being a great scholar and leading a very busy life, Hafiz Sahib never shied away from doing mundane tasks. He used to say that given the fact that the Prophet (peace and blessings of Allah be upon him) assisted his wives with household jobs, it could not be a stain on one's status or masculinity to following his example. He was also proud to clean the mosque, saying that not everyone is given the honour of cleaning the house of the Lord. The biggest aspect of Hafiz Sahib's legacy is without doubt Makkah Masjid, which was his vision and which only came into being as a result of his tireless efforts. For many years, Hafiz Sahib was deeply concerned that the converted terraced houses which formed Madina Masjid were not adequate to cater for the growing Muslim populations of Leeds 3, 4 and 6. His vision was that the community should have a Masjid of which it could be truly proud, which was not only aesthetically pleasing but which would also meet the practical needs of the Muslim community it would serve. He talked about a Masjid that would elevate the spirits of all who saw it and symbolise the beauty of the religion of Islam. 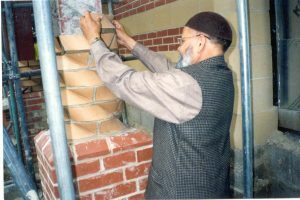 To this end, Hafiz Sahib worked assiduously firstly to help find the perfect location in which to build his dream Masjid, and then to raise the £1.8 million required to fund its construction. The passion with which he talked about the new Masjid encouraged the local communities to donate the staggering sums needed; very few individuals have the charisma and zeal to convince others to donate so generously. He reminded everyone that if they contributed towards building a house for Allah (swt) in this life, then, as is promised in the Holy Quran, Allah (swt) would build a house in Paradise for them in the hereafter. Following years of hard work, Makkah Masjid opened its doors in June 2003. 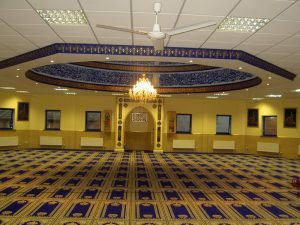 Without doubt, it would never have come into existence without Hafiz Sahib firstly having the vision of a magnificent Masjid located in Headingley, Leeds and secondly having the dedication to make his dream a reality. Those who knew Hafiz Sahib as their Imam, their teacher and their spiritual guide are only too aware that he was a truly unique individual, who cannot be replaced. He was a very inspirational and dynamic person. He wanted to see the learned and professionals work together to advance the position of the Ummah, and reach mutual understanding and respect throughout the world. In a life span of 63 years, he will be remembered for, among other notable things, being a great scholar of Islam who practiced what he preached and instilled love for the religion in those who came into contact with him. His entire life was dedicated to steadfastly serving Islam and Muslims. 4. The importance of making an effort in one's life to improve one's status in the world and the hereafter. We pray to Allah (swt) that He grants Hafiz Sahib the highestplace in Paradise, and makes the Holy Prophet (pbuh) and the Holy Quran his intercessors on the Day of Judgement. Ameen.